Basketball Late-Season Tune-Up - Preparing for March Madness! It's late in the season and we're just about to enter our post-season tournament, aka "March Madness". What adjustments do you make at this point in the season? I'm talking mainly about high school varsity teams here. First, an observation and an opinion... a lot of coaches and players would probably disagree with me here. Over the many years that I have been involved with high school basketball, I have had the fun and opportunity to be involved with excellent coaches and some very good teams. But, to me, it almost seems like the high school season is a little too long (we play 20 regular season games and then the tournament). Almost every season, even with our very best teams, I see kids getting tired toward the end of the season. Practice energy is down. Kids get sick with colds and the flu, they get worn down and tired, nagging injuries occur, and some frankly get sick of basketball. I believe the season could be a little shorter... but that's just me. As I said, many (maybe most) would disagree with me. So what do you do late in the season with your practices and getting your team ready for post-season play? Do you and your coaches beat your heads on the wall trying to get your players to be more intense in practice... most would. But another observation I have made is that each team has it's own "character"... and characters! And of course, the old dictum is still true that "you play like you practice"... well, for the most part anyway. But some high school kids are frankly a little goofy and immature and just can't be 100% intense every practice. You're going to have an occasional practice where energy and attention levels are down and you want to just scream at them, or make them run. We had an awful practice like that last week, the day before a big game. I was not optimistic about the game. To my surprise, we came out with great energy for 32 minutes and won by 25-30 points! So I think you have to figure out your own team... maybe a "soft" practice is not always so bad, if they come out and play hard on game-night. 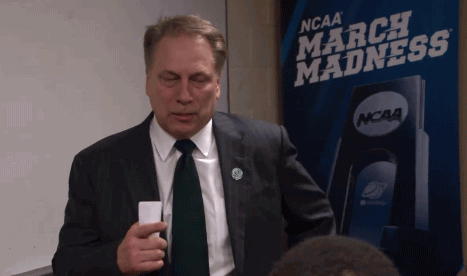 Really, it's about getting your team ready to play as hard as they can during games. So a bad practice doesn't bother me as much as it used to, so long as we play hard on game night, and so long as bad practices don't become a habit. Late in the season, we shorten practices. We try to get the kids to practice hard and reward their energy and attention by shortening practice to 60-90 minutes. We will do shooting drills and free-throws every practice. We will scrimmage and go 5-on-5 up and get down the floor for some aerobic work-out. By this time in the season, they should know your offenses and defenses, press offense and press defenses. We will however, drill a certain aspect or detail of any of these that needs attention. We might work on some late-game situations. We will quickly review some of our plays. We will target our practice somewhat to our next opponent... if they play zone, we spend some time on zone offense. If they press, we practice our press-breakers. We will address what they are trying to do on offense and how we intend to defend them. But we don't want to be overly concerned about what our opponent might do... we want to focus on what we want to do, and let them worry about us. Trying to make a big change, such as changing your defense from man-to-man to zone, or vice-versa, at this point in the season will usually cause more problems for you than your opponent. At this point, you have to usually go with what you know you can do. At the end of practice, we get a cheer and remind the kids to go home and get plenty of rest and sleep, and not stay up all night playing video games. They need their sleep to maintain health and energy, get over sicknesses, heal injuries, and to be good students. We remind them to eat right, and avoid a lot of junk food. We will also remind them from time-to-time (especially before a weekend) to stay out of trouble and avoid making stupid, bad decisions that might get them benched, or kicked off the team. Retired Coach Ken Sartini, also recommends that at the end of practice, do something fun... a goofy contest where they could make fun of each other... or use some time to run game "situations", which the kids also like doing. We play each of our conference opponents twice during the regular season. By the end of the season, every coach in the conference pretty much knows what everyone else is doing on offense and defense. So we will add a few new plays for the post-season tournament. We will purposely "hold back" a couple favorites and put them in just for the tournament. We will usually add a couple new out-of-bounds plays vs man-to-man and zone defenses, and a couple new half-court plays designed to get good shots for our best players, and maybe a new sideline out-of-bounds play. The plays that we select again depend on our personnel. If we have a great outside shooter, we'll put in a play for him. A great post player... we look at something that will help us get the ball to him inside. A great point-guard... we'll try to stretch the defense and let him attack the seams with the dribble. "Kentucky-2" gets an open 3-point shot for our shooting guard O2. "Kentucky-3" is the same play and gets a shot for O3 instead. Kentucky-2 is run to the right side while Kentucky-3 goes to the left. We run these out of either a 3-out, 2-in or a 4-out, 1-in set. This play gives our O2 an excellent chance for a three-pointer. See diagram A. 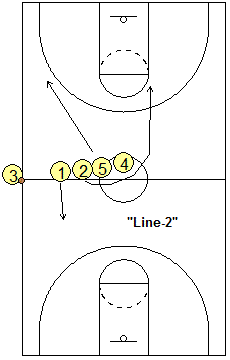 The play starts with a weave screen with O1 dribbling toward O2, handing off and screening for O2. Meanwhile, O5 cuts up to the weakside arc. O3 initially slides toward the corner (for spacing) but will eventually move back outside. 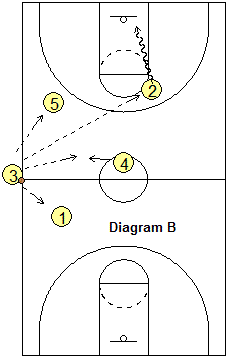 See diagram B. O2 dribbles toward the point and passes to O5. To get good spacing, it is important for O2 to dribble high to the top, even with the lane line. O4 screens for O1 who cuts around the screen, eventually out to the opposite corner. O5 can pass to O1 inside as our first "early" option. After screening for O1, O4 moves up and backscreens for O2. It's key that this back-screen for O2 is set very high, in line with the right lane line, so that good spacing results for the flare pass to O2. See diagram C. O2 cuts around the back-screen and flares to the wing-corner area. O5 skips passes "over the top" to O2. After back-screening for O2, O4 rolls to the ball-side low post. O2 has the option of shooting the three-pointer, or passing inside to O4 in the low post. If the pass to O2 is denied, then O4 can post up inside and O5 can make the "hi-lo" pass to O4. Notice the weakside rotation after O5 passes to O2... O5 drops to the elbow, O3 rotates out to the point and O1 rotates to the left wing. Another option is the "slip" (diagram C). After O2 hits a couple of "3's", the defense may switch the O4-on-O2 screen. If the defense switches O4's screen on O2, O4 slips the screen, and cuts hard through the lane to the hoop, for the pass (red arrow) from O5. This is the same as "Kentucky-2" except to the left side. See the diagrams below. O1 dribbles left, hands off to and screens for O3. O3 dribbles toward the top and passes to O4 who has moved out on top. O5 screens for both O1 and O3. O4 looks for O1 cutting inside, or for the over-the-top pass to O3. After screening for O3, O5 cuts to the ballside block. O5 could get the pass from either O3, or directly from O4 ("slip" option) if the defense overplays the O5-on-O3 screen. We like to use this "hi-lo" play when we have a good strong inside post player, and if we think this player can beat his/her defender 1-on-1 with a post move. This is a great play also if the post defender is in foul trouble as it exposes him/her to another fouling situation, or he/she may simply play "soft" defense and allow us to score. We like the "hi-lo" feed to the low post coming from the top, as there is usually no helpside defense when the ball is at the top. See the diagram below. O1 dribbles off toward the right wing as O2 locates in the corner. O4 moves to the top of the key and O1 passes to O4. O5 makes an aggressive post-up in the paint and O4 tries to make the "hi-lo" pass inside to O5 (oftentimes a "step-around" left-handed curl-bounce pass). O5 scores or gets fouled. This is our first option. The pass from O4 to O5 must happen quickly so as to avoid O5 getting a three-second violation. Timing is important. After O1 passes to O4, O2 backscreens for O1, and O1 slides to the wing-corner area. If the pass inside to O5 is denied, O4 could skip-pass over the top to O1. O1 could shoot the three-pointer, or pass inside to O5 who posts up on the ballside as soon as the pass goes to O1. Another option that we use when the pass from O4 to O5 is being denied is to have O4 fake a pass to O5, and make a quick dribble move to the hoop around the right side of the defender. After you run "Blitz" a couple times, the defense may be looking for this play and may overplay and deny the pass from O1 to O4. In this case, O4 can simply backcut up the right side of the lane and get the pass from O1 for the lay-up. Another option is, instead of O1 passing to O4, O1 passes inside directly to O5 posting up. We call this option "15". We can also run "Blitz" to the left side, where O1 dribbles left and passes to O4. From here, the play is the same with O5 now back-screening for O1. Another option is "Thumbs-Down" where we run the basic "Blitz" play, but O4 down-screens for O3. O3 comes up to the arc and gets the pass from O1 and now O4 posts up inside... it's the same as "Blitz", only here O4 is your inside post player. "15", "Blitz-Left" and "Thumbs-Down" are all just adjustments made to counter how the defense plays us. Zone Plays - "Special" and "Special-Down"
Take a look at these two simple, effective zone plays that you can use to score inside vs the 2-3 zone defense. This play has a number of good options. We set-up in a box, with O5 wide. O2 cross down-screens for O1 (diagram A), and O1 cuts to the ball-side 3-point arc, as O2 then moves to the opposite corner. We want the inbounds pass to go to O1 (but it could go to O5 and then out to O1). As the pass goes to O1, O5 then screens for O3 and O3 cuts to the ball-side corner for a possible pass and 3-point shot (diagram B). If the defense switches the O5-O3 screen, O5 should get open by sealing the X3 defender and receive the pass from O1 for the inside shot. This could also be a size mis-match in your favor. Now comes the fun part... meanwhile, after O1 receives the inbounds pass, O4 starts to cut up high calling for the ball. If the X4 defender overplays and denies, O4 quickly back-cuts to the hoop for the lob pass from O1 and possible dunk (O2 should have already cleared out to the corner). This option may not be open vs zones, but the prior options could be. Diagram A. Notice that the defense is aligned in a 2-3 zone. O3 is the inbounder. O1, O2, O4 and O5 "stack", or line-up, along the ball-side lane. O5 lines up near the elbow... it's important that we start this "stack" high enough, in order to get good spacing. O4 stacks outside the X1 defender. O1 and O2 form a mini-stack above the X1 defender. When O1 yells "go", O2 (your best shooter) cuts around O4's screen to the ball-side corner, calling for the ball. This should influence the outside low defender to move out to the corner to defend O2. O5 seals the middle, inside defender. If the X4 defender stays inside, O2 gets the pass and the three-point shot (diagram A). If the X4 defender to moves out toward the corner, O4 slides down the lane into the gap looking for the pass and shot (diagram B).You should have a 2-on-1 situation with the X4 defender. Either O2 or O4 should be open. O1 moves out of top as our safety. This sideline play can be used as a standard sideline play or a half-court, last second play when we only have a few seconds left on the clock. O4 starts low and sprints up to receive the pass from O3. Meanwhile, O1 screens for O2 and after screening, cuts hard to the back-side wing for a quick pass from O4 and the shot, or lay-up, depending on how much time is left. After in-bounding the ball, O3 cuts to the left wing and could also get the pass and last-second shot. If both wings are covered, O4 may have to take the shot. If time is not a factor, O2 is our safety pass in the back-court. 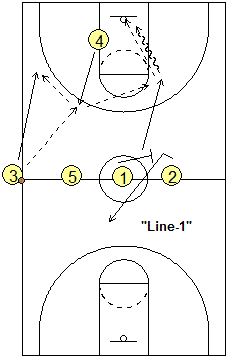 This sideline play also uses a "line" set (see diagrams above), and tries to get a lob pass to O2 going to the hoop. Of course, you can change this to fit your own personnel. O1 cuts into the back-court as our safety outlet. O2 cuts hard around O5 and O4. O3 looks to make the lob pass over the top to O2 cutting to the hoop. After O2 cuts, O5 moves to the ball-side wing area and O4 cuts straight toward the ball. If the pass goes to O1, O5 or O4, then just set up in your usual half-court offense. To make a tournament run, your team must be coming together, "gelling", at the right time. They must play hard for 32 minutes each game, and play together. They have to "play to win", and not "play not to lose", which means they can't worry about winning and losing, and making mistakes and missing shots... they just play as hard as they can, with every player doing his job, having the courage to try to score, and have fun. Key players must learn to avoid getting into foul-trouble. Big tournament wins and upsets are usually the result of the underdog team playing tenacious defense, and out-hustling and out-rebounding the favored team. In tournament time, you must not rely night after night on winning with 3-point shooting, because when you have an off-night shooting, you're done. You must attack the rim, get the ball inside and get to the free-throw line. Get players to get over pre-game jitters by telling them that to be nervous is a good thing, to be expected... and they should use that nervous energy early in the game to play tough, hard pressure defense, hustle and dive after loose balls, and be aggressive on the boards for rebounds. As the saying goes, "it takes no talent to hustle." If you do the hustle things well, your offense will usually fall into place too. On offense, make the easy pass and avoid turnovers. Some coaching strategy... finish the quarter with the last shot if you get the chance, especially if you have the possession arrow for the next quarter... this could result in back-to-back baskets for you. Coach Bob Knight recently pointed out on television the importance of finishing the first half... the last 4-5 minutes, and then the importance of starting the second half... the first 4 or 5 minutes.